The classic icon of flower giving. A beautiful bouquet 24pcs long-stemmed fresh red roses with greenery and ribbon. 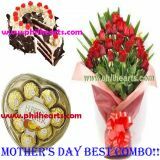 , 8pcs ferrero rocher heart shape box, and red ribbon black forest (regular size). Your purchase includes a Free Greetings Card. Order now! Delivery:only metro manila!!! �Philhearts is committed to ensure fastest Same Day Delivery in the industry. Our state of the art logistics enable us to select most suitable route, vehicle type and courier all in a matter of seconds when you place your order with us. We deliver 7 days a week including holidays. �We never stock any item. Our JIT inspired Activity Based Inventory Systems effectively ensure our Zero Stock Policy. �All bouquets are hand prepared by our in house florists only after order is received to ensure optimum freshness. �Provincial bouquet will be delivered as separate item(s) with a Free full color standard size picture to facilitate rearrangement. �Our cut off time is 10 Am Local. Orders received after cut off time will be delivered on the following day.